Happy Days it’s only minus 12C out! Happy day! It’s warm out! It was only minus 12C (10F)this morning, which was much warmer the the minus 29C (-20F) on the weekend. The wind chill on the weekend was brutal – minus 40C or 40F what ever what you looked at it. Cold! We were just happy to get in a great run on our screw shoes as the sun came up! 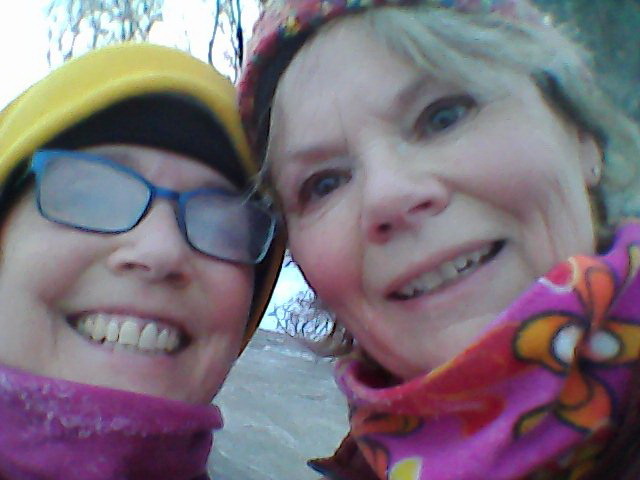 Foggy glasses, blurry eyes and frozen camera but always with a smile when we are running! We’ve run for the last time with crampons that fly off when we least expect it. You know how it is out there, the roads and trails are slick, icy, and slushy and you still “need” to run. So you dig out your crampons, those little rubbers with the picks, chains or coils that are supposed to give you a little extra grip. But sure enough either you can’t find one or both of them or within the first kilometer of running in them, they twist or fly off. We decided, enough is enough, we decided to screw our shoes. We dug out a pair of worn but not worn out shoes and then stopped at the hardware store for a package of sheet metal screws. 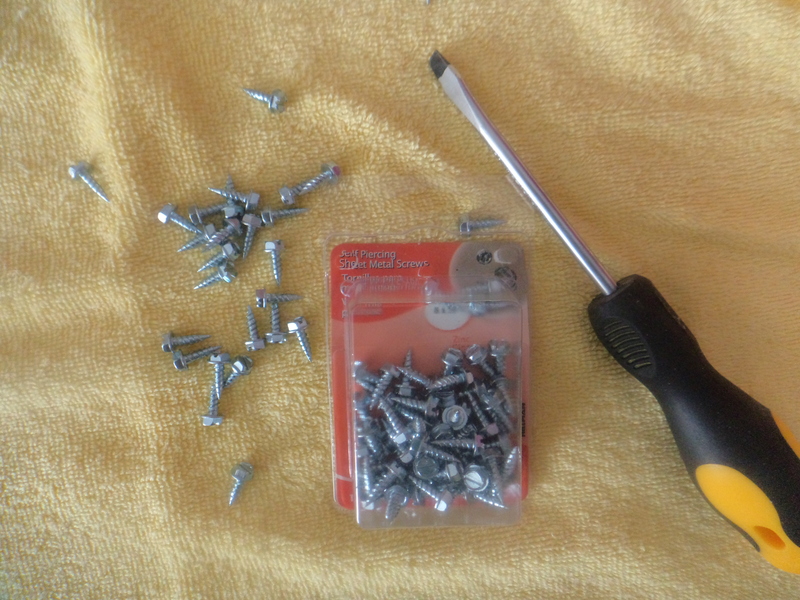 We picked up a package of self-starting, ½ inch sheet metal screws. The shoes we picked were old trail shoes but apparently any shoe will do with the exception of shoes with very thin soles like racing flats. Total cost was about $8.00 for 100 screws, enough for a few years. 1/2 inch sheet metal screws and a screwdriver. It was really easy to put them in the shoes. All we needed was a flat end screwdriver and a little elbow grease. We put the screws in the raised tread of the shoe. We had no worries about the tip of the screw going right through the sole. We would have to use a longer screw than a ½ inch for that to happen. When deciding where to add the screws, I had a look at the wear pattern on the shoes. It took just a few minutes to add the screws. We did a little investigation on how many to put in (http://www.skyrunner.com/screwshoe.htm, http://www.competitiverunner.com/screwshoes.html) and decided on 11. We didn’t put any in the middle of the shoe; we thought we would give it a go with the screws lining the outer edge of the sole. In total our screws only added ½ ounce to the weight of our shoe, not that we care but that seems to be an issue with some runners. 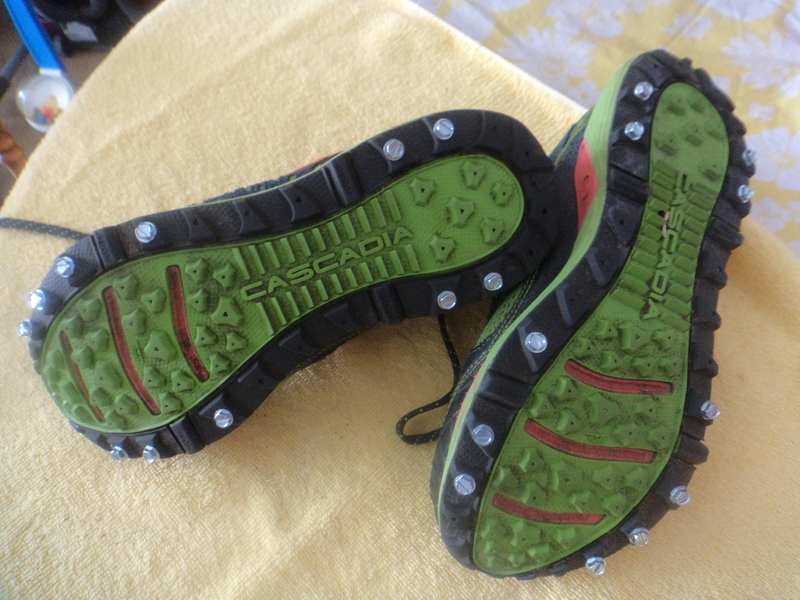 According to Competitive Runner: You can use Screw Shoes on almost any surface. You won’t notice them on pavement, except for the clicking noise. They work pretty well on ice, as long as you are using new screws and the ice isn’t too hard or thin. They are best on hard-packed snow, but only moderately helpful in deep, slushy snow. We figure any traction is welcome. Here’s to winter running and screw shoes. 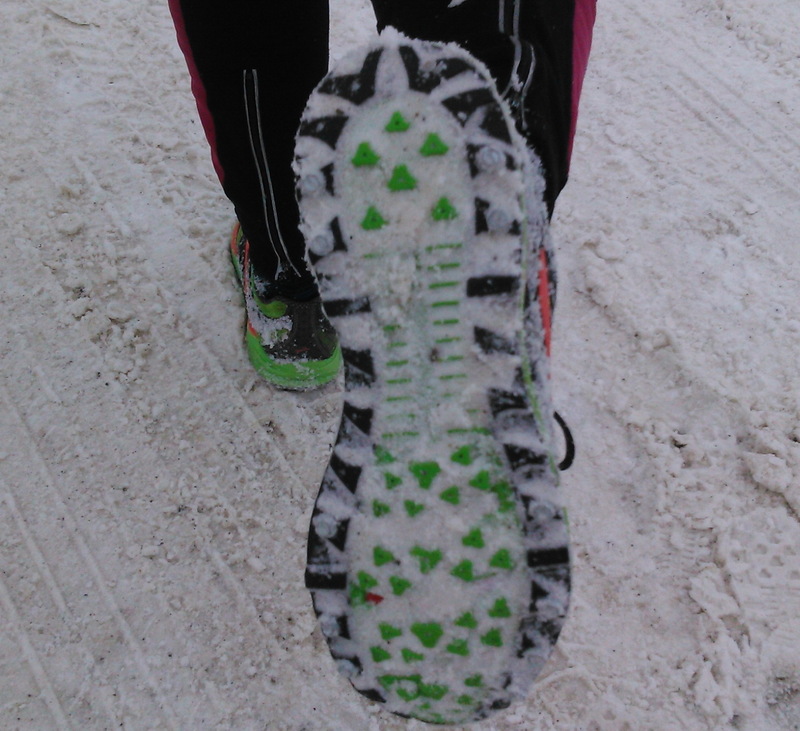 Here is a little update: We ran on snowy, slushy roads and fresh trails this morning and they worked great! Sometimes you have to be picky. As we gear up for another great year we are being thoughtful deciding which events we want to enter. There are so many events available to enter now that we have to be a little picky. There are a number of things we consider. Location – can we drive there in a few hours and return home the same day or do we need to stay overnight? Not that we don’t like staying overnight but for some events, spending hours in a car makes them a little less appealing. Expense – there is another consideration. Event prices are going up every year. You would be hard press to find an adventure race or ultra; or even a marathon or half at the $50.00 range any more. The expense of running any type of events requires the organizers to charge a higher entry fee. Then there is the sure number of events. We could do an event just about every weekend. We have to consider the type of event we enter and the time it will take us to recover from the event. We just aren’t as young as we used to be. After all bruises, scrapes and stitches take time to heal! Back to back events are tough to pull off. 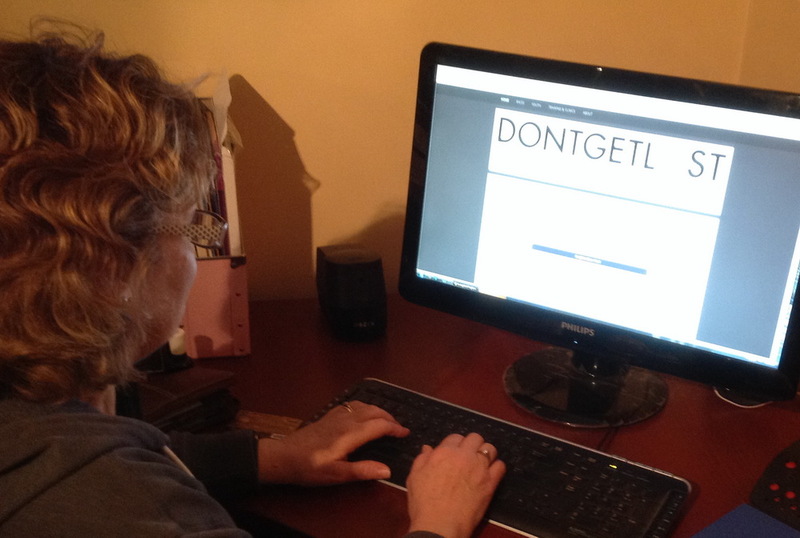 That been said, we are having fun reviewing our favorite race websites, investigation new ones and marking on our calendar when every event takes place. We are excited that we are planning to navigate through Raid the Rib Adventure Run in April. We have in listed our friend Jean to be the “bandage” to the Blister Sisters and the Bandage. In May we’ll be storming along running, riding and paddling in Storm the Trent – Ontario’s best adventure race. Now we just have to plan the rest of May, June, July, August, September, October, November and December to complete a great year!